(CNN)With international sanctions on their way out, the world is running out of excuses not to visit Iran. One look at this collection of images is going to pile on even more pressure to get there quick. 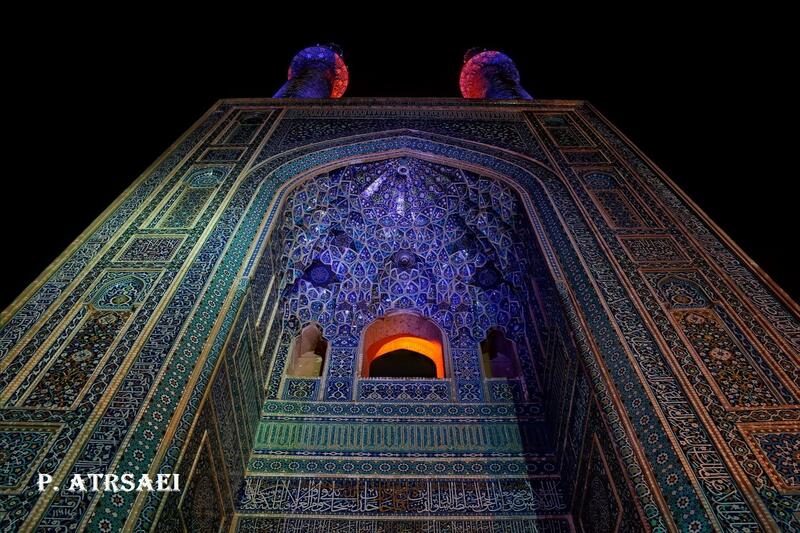 They're taken by Iranian photographer Mohammad Reza Domiri Ganji, who made a name for himself with a collection of gorgeous, intricate shots of Iranian mosques. We asked Ganji to guide us to his favorite Iranian places, and show us the scenes he captured along the way. Iran marks its national day on February 11, a date that celebrates the 1979 Islamic revolution that set the country on a path to sanctions. It's a day likely to stir mixed emotions, but there's one thing that is certainly worth celebrating -- the beauty of this fascinating country. Located on the western edge of Isfahan's Naqsh-e Jahan square, this six-story palace's name means "grand doorway." Built during the 16th- to 17th-century reign of Shah Abbas I, it includes a red-colored "music hall," named for the tuneful echoes of its jar-shaped wall decorations. "The unique and gloriously repetitive stucco ornaments and special architectural style left me no choice but to stare at the ceiling and try to photograph it as best as I can," says Ganji. "I stood exactly in the middle of the music hall and took the photo from above my head with a wide-angle lens." "The unique architecture, lighting and patterns presented in the Iranian baths catches the eye at first glance," says Ganji. Built in 1971, the Azadi tower became an icon of Iran's capital city, Tehran, and remained so even after the city's vast Milad tower was built in 2009. It was created by architect Hossein Amanat under direction from Iran's last queen, Farah Pahlavi, to mark the 2,500th anniversary of the Persian Empire. "I like this tower for its unique architecture," says Ganji. "I've always tried to choose subjects that are symbolic, so that I may project their greatness through photography and the Azadi Tower is a perfect example. "In this instance I used a fisheye lens to give the tower a unique effect. The presence of the clouds also helped." Badab-e Surt natural springs have been formed over thousands of years. * * * Located in the north of Iran, this natural spring produces water rich in salts and sulfur. "It has a reflection of the sky that adds to its charm and beauty," says Ganji. * * * This 19th-century carpet merchant's house in Kashan today serves as the base of the city's Cultural Heritage Organization. "The house has aesthetic significance because of the molded ornaments and paintings created by distinguished 19th-century painter Kamal-ol-Molk," adds Ganji. * * * Carpet-making is one of the oldest and most important industries in Iran, says Ganji. The floor coverings are famous worldwide for their quality and designs. Ganji's photo is taken in a carpet repair workshop in the city of Shiraz. He adds: "I tried to capture the spirit of life which exists in this workshop and its workers. Every carpet brought here to be repaired has a spirit too." * * * The 18th-century Dolat Abad garden follows a classic Iranian design, divided into two sections. The outer part includes gardens and beautiful spaces that can be seen from the entrance. The inner portion represents the Iranian architectural concept of family privacy. This building has a distinctive windcatcher -- a roof tower used for ventilation and natural air conditioning in desert areas. "The applied symmetrical molding ornaments and colorful glasses in this edifice are exceptional," Ganji says. "But what really grabbed my attention was the windcatcher. There's a pool in the middle of the building and when wind flows over it, the water evaporates and cools the environment." * * * This building stands in Tehran's 19th-century Golestan Palace complex and was the location for the 1896 coronation of the Qajar dynasty Persian ruler Mozaffar-ad-Din Shah Qajar. "The exclusive ornaments of this building, such as the glasses, the mirrors, and tall columns are of exceptional beauty," says Ganji. * * * One of the most famous historical gardens in Iran, these grounds and the building within them were built in the mid-13th century, but renovated 600 years later. "As I walked into the gardens, the first thing I noticed was the positive energy emanating from the place due to its green and colorful surroundings," Ganji says. "It wasn't just the plants. The grand building also had me in awe due to the vast range of colors and patterns used and its unique architecture. "More striking was the lake feeding small streams that water the gardens. "In order to enhance the light and color of the scene, I took the photo during sunset." * * * Built for Qajar era Shiraz dignitary Forough-Al-Mulk, this three-story building now houses a museum. * * * Shiraz has a reputation as a city of great poets and poems. "This photo shows a building where anyone can pen verses and hang them on the wall -- their own creations or an old favorite," says Ganji. "It's also a place for drinking tea and smoking hookah. "When you enter here, it's interesting to read the different poems written with different handwriting." Some believe it's built on an ancient fire temple. "When I entered the mosque I was amazed by the fantastic artwork in its ceiling," says Ganji. "It got my attention and when I saw that view, I wanted to photograph it. "The dome of the mosque has amazing arabesque patterns and four skylights that show geometric shapes beautifully. "Quran verses written all around the dome add to its glory and beauty." * * * Located in the southwestern Iranian city of Julfa, this bath was originally used by royals of the 16th- to 18th-century Safavid dynasty and later opened to the public. Ganji says: "This photo shows the historical monument's 'Sarbineh', a vestibule, spring house, and greenhouse." * * * Maranjab: Desert reflections. 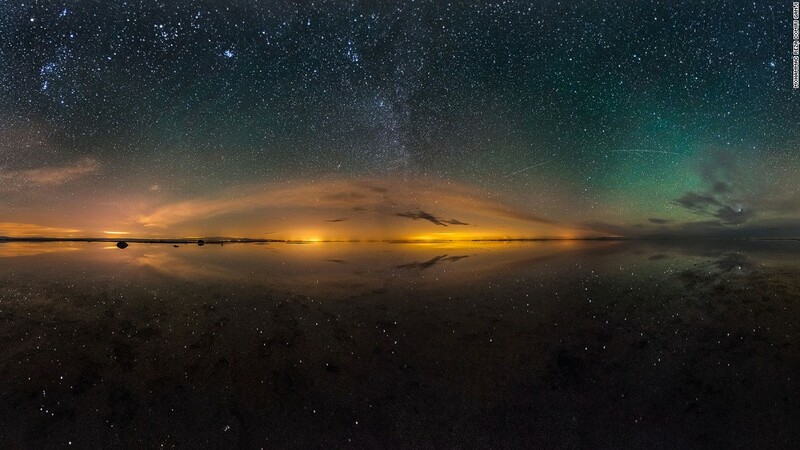 "The salt lake next to the Maranjab desert south of Tehran. It's actually a dried lake that only very occasionally collects water after heavy rain or snow. "I walked far alongside the lake before setting up my tripod for this panoramic night photo," says Ganji. "This is taken on a regular day and shows what a desert is supposed to look like -- dry and hot white sands shining under the sunlight," adds Ganji. "This shows a surprise view of the desert -- covered in snow," explains Ganji. "When I saw snow had fallen in another part of Iran, I was curious to know if it was falling in other places. "After hours of driving along a freezing snow-covered road, then hiking to reach the desert, I managed to photograph this rare moment just after sunrise." "In fall and winter when sunlight shines through the glass, it casts the bedchamber in a beautiful light," says Ganji. "I've seen stained glass work in many architectural buildings, but this is exceptional. From dawn, the mosque is filled with color and light, dappling the Persian rugs, the ceiling and wall tiles with patterns and colors. "I'm amazed at how the architect was able to combine so many things to build such an exquisite mosque. "I visited on a winter morning and waited for the light that moves gently from left to right to fall exactly in the center so my photo could be completely symmetrical." In the decade before the Islamic revolution, this palace served as a residential home for the shah's family and was where they met foreign guests. The complex was originally built in the Qajar era, but the main palace was built under orders from Mohammad Reza Shah Pahlavi, Iran's last shah. Third-century Persian ruler Ardashir I -- the founder of Iran's Sassanid Empire -- built this palace for himself. The capital of Cyrus the Great's Achaemenid Empire, sometime around 550 BC, lies about 130 kilometers northeast of the city of Shiraz. "This is a very important monument, as it is relates to one of the most famous Persian emperors," says Ganji. "For this reason I've always wanted to immortalize the place at its best, under a star-filled sky." "The Milky Way is only visible on certain summer evenings where the sky is clear and there's no moon. "Normally, no one is permitted to enter Pasargadae, so as well as finding the perfect time and moment, I also had to obtain various permits to take this photo." Says Ganji: "When I was taking this photo, I lay on the ground for several minutes, staring at the sky. "I imagined I was there thousands of years ago at the time that Cyrus the Great lived with his council, ruling the greatest empire of all time -- Persia." Persepolis: City of kings and emperors. Persepolis was one of the most important cities of Persian Empire it was destroyed in 330 BC during Alexander the Great's invasion of Persia. "I've always loved this historic complex because it's a reminder of one of the great empires of Iran and is part of our historic identity," says Ganji. "When you walk through the Gate of All Nations and enter Persepolis, it's best to think of just one thing: This is exactly where many kings and great emperors have set foot. It's an incredible connection to the past. "As with Pasargadae, this took a lot of effort to photograph because it's hard to get permission to enter at night." Located on the southern side of Isfahan's Naqsh-e Jahan Square, this mosque belongs to the Safavid era and was built under orders from Shah Abbas I. "The ceiling of this place is like none other," says Ganji. "One of the most exquisite works of architecture, it's hard to look away. "I stood in the middle of this structure and used a wide lens so I could capture its perfect symmetry and the ceiling in its entirety." It's the only mosque in Iran that doesn't have a courtyard. Another Safavid dynasty treasure, this place gained fame through a shrine built to Shah Ismail I's ancestor Sheikh Safi al-Din. This picture shows the building's porcelain dome, with alcoves that once held goblets and jars gifted by a Chinese emperor. It's a popular place to stroll. Cool and clean: Sultan Amir Ahmad Bathhouse. 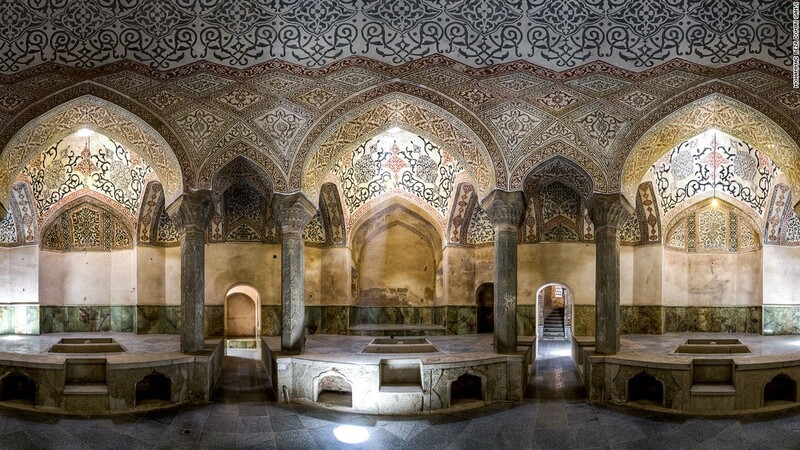 A mix of 11th-century Seljuk era and Qajar era construction, this bathhouse is notable for its astonishing molded ornaments and thick plasterwork made with lime and mortar. "To photograph this bath I went there several times and sat on its couches for hours," says Ganji. "I tried to choose a time when artificial lights were off and the only source of illumination was the light from holes in the ceiling. "An interesting fact that I discovered is the bath's heat source is just a small flame, with warmth and smoke transferred by small channels beneath." Also known as the Black Monastery due to the dark stones used to build it, this monument in northwestern Iran is a relic of the region's early years of Christianity. A place of pilgrimage for many Armenian people, it's built over the tomb of Christian missionary St. Thaddeus (or St. Jude) and retains its status as a monastery. "Because of its importance for non-Muslims in Iran, I've always wanted to take a photograph worthy of this building's status to add to my collection of my historical places in Iran," says Ganji. "After obtaining the necessary permits to photograph after dark, I was able to capture this panorama on a very cold winter night. "Other than the small guard room, there was no light." 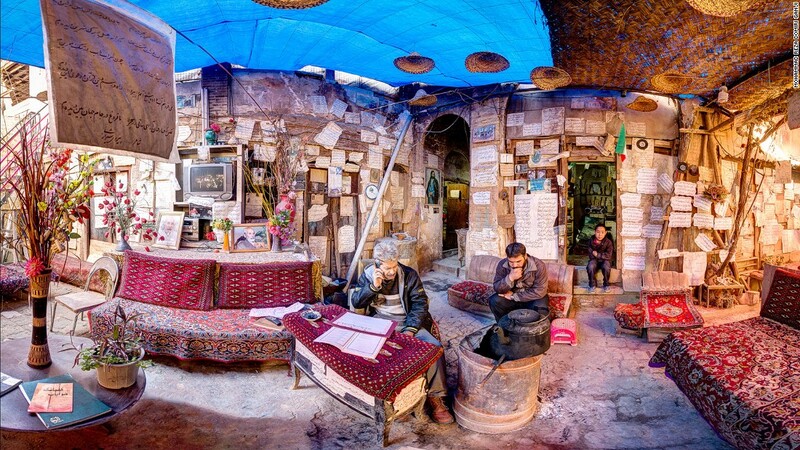 This small caravanserai, or inn, located in Kashan's bazaar consists of small roofed spaces that were mainly used for selling carpets and other luxurious goods in the Qajar era. "All around there are shops selling rugs and historical artifacts, but the most amazing view here is this ceiling," says Ganji. "Under the ceiling there's a big pond, which I had to stand in to take this photo directly under the ceiling's center." Says Ganji: "Contrary to appearances in this picture, this place is always very busy, particularly in the late afternoons and evenings. "It's a popular site, with poets and poetry enthusiasts, groups of friends and young couples all coming together to recite Hafez's romantic poems. "I used a fisheye lens to take this photo on a day that two popular Iranian teams were playing football. Most people were at home watching the match, so it was much quieter." "The amazing symmetry of the architecture and its limestone embellishments make this bath one of a kind," says Ganji. "To capture this stretched panorama, I needed permits to allow me to stand in the middle of the deep bath." Another Zand dynasty building, this is one of the Iran's most beautiful mosques, decorated with colorful ceramics. "I like this mosque because of the many pillars used inside," says Ganji. "As you enter, the repetition of these pillars makes the place grand and beautiful, and gives the impression of many separate spaces. "In my photo I've tried to show this repetition in the best way." Built during the 17th century by Armenian settlers, this cathedral's decorations include delicate blue and gilded ceiling paintings depicting the Genesis creation story. The church is still used by Armenians in Isfahan today and is open to visitors. "I was amazed by the golden color of the ceiling and the unique paintings all around," says Ganji. "I put my camera on the floor and tilted it upwards using a wide lens to capture this photo."